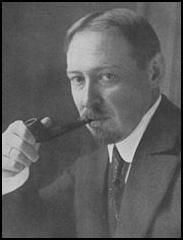 Louis Raemaekers, the son of a newspaper editor, was born in Roermond, in the Netherlands, on 6th April, 1869. He studied in Amsterdam and the Brussels Academy. Raemaekers became a political cartoonist and his work appeared weekly in the newspaper Algemeen Handelsblad between 1906 and 1909. Although from a German family, Raemaekers was appalled by the behaviour of the German Army in Belgium in 1914. In the First World War he achieved fame for his cartoons of Kaiser Wilhelm and other German politicians that were published in the newspaper Amsterdam Telegraaf. This included a cartoon that showed the death of Edith Cavell. In his work Raemaekers "depicted the Germans as godless and the Kaiser as the ally of the Devil." In 1915 Raemaekers had an exhibition of more than 500 of his drawings at the Fine Art Society in London. The Dutch government decided to prosecute Raemaekers for "endangering Holland's neutrality" but he was acquitted by a jury. The German government now offered a reward of 12,000 Dutch guilders for Raemaekers' body, dead or alive. Afraid of being murdered by German agents Raemaekers decided to move to England in 1916 and his work was published in The Times. The British prime minister, David Lloyd George, was so impressed by his work that he persuaded him to go the United States where his drawings were syndicated by Hearst Publications in an effort to enlist American help in the war. Henry Perry Robinson, who reported the war for The Times, claimed that Raemaekers was one of the six men - including statesman and military commanders - whose effort and influence were most decisive during the First World War. An exhibition of 150 of Raemaekers' drawings toured England, Scotland and France. His book, Raemaekers Cartoon History of the War, appeared in 1919. Percy V. Bradshaw argued that "he (Raemaekers) drew with astonishing freedom and vigour, and exposed the bestial treachery of the German Warlord and his fellow criminals with a flaming indignation which no other wartime artist surpassed." After the war Raemaekers returned to the Netherlands where he worked fot the Amsterdam Telegraaf. 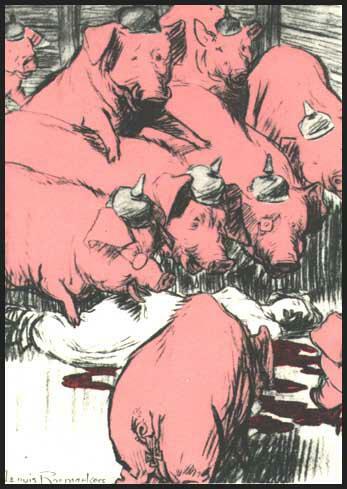 During the 1930s he produced several cartoons attacking events in Nazi Germany. Louis Raemaekers died in Scheveningen on 26th July 1956.